I’ve been into cars since a family member bought me a toy car when I was about a year and a half. That toy car was the first of what today has become a large collection of model cars ranging from 1/12- to 1/87-scale. My collection started to include 1/1 cars at the age of 15 when I bought a 1984 Saab 900 S with a bad automatic transmission. Today, I’ve got enough cars to create my own traffic jam – some run, some don’t, some are for parts, most of them are pictured below. 1979 Mercedes-Benz 300D. My fifth w123, a very clean car purchased from the second owner. It currently has 280,000 kilometers (roughly 173,000 miles). 1969 Renault 4. A very original car that only has 73,000 documented kilometers (roughly 45,000 miles) on the clock. It’s a project that needs brake, fuel delivery and electrical work. 1978 Citroën 2CV 4. I purchased it from a man who had it sitting on his farm. After work on the brakes, the body, the carburetor and the electrical system, it passed inspections and is an occasional driver. 1983 Citroën GSA. Bought from the original owner’s grandson with 76,000 kilometers (47,000 miles) on the clock. I used it as a daily driver for over a year and it’s up to 86,000 (53,000 miles) at the time of writing. 1981 Renault 4 F4. A work van that has become a daily driver. It is in decent shape though it has a couple of holes in the floors, and the odometer reads 122,000 kilometers (75,000 miles). I am the fourth owner and the car is on its second engine. 1972 Volkswagen 1302. It’s mechanically sound — I drove it halfway across France. The plan is to get it looking stock again. 2003 Jeep Grand Cherokee. Not a classic by any means but interesting in its own right. At first glance, it looks just like a regular second-generation Grand Cherokee you’d find at a sketchy used car lot on the outskirts of Detroit. The turn signal repeaters signal it’s a Euro-spec model powered by a 2.7-liter turbodiesel five-cylinder engine sourced from the Mercedes-Benz parts bin. The automatic transmission comes from the German side of DaimlerChrysler, too, but the Quadra-Drive four-wheel drive system is all Jeep. It was built in Graz, Austria, by Magna-Steyr. So while it has an American passport, this Grand Cherokee has never been to America. Cars I have previously owned include (in no particular order) a 1984 Saab 900 S, 1987 Alfa Romeo Milano Gold, 1978 Lancia Beta, 1978 Alfa Romeo Spider, 1973 Alfa Romeo GTV, 1971 Fiat 850 Spider, 1971 Fiat 850 Bertone Racer, 1979 Mercedes-Benz 300D, 1985 Renault 4, 1983 Mercedes-Benz 300D, 1992 Mercedes-Benz 300E, 1997 Fiat Brava, 1962 Volkswagen Beetle, 1974 Renault 4, 2005 Fiat Ducato Maxi Cargo, 1969 Alfa Romeo Giulia 1300 TI, 1973 Volkswagen Bus, 1993 Opel Corsa, 1996 Lancia Y, 1989 Saab 900 Turbo, 1966 Alfa Romeo GTV, 1988 Alfa Romeo Milano Verde, 1984 Mercedes-Benz 300D, 1991 Renault 4 Savane, 1980 Renault 14 TL (x2), 1994 Volkswagen Passat wagon, 1983 Citroën GSA wagon, 1983 Citroën Visa, 1996 Citroën Saxo, 1981 Mercedes-Benz 230E and a lone Japanese car, a 1990 Toyota Corolla wagon. Je viens de visionner ton site et de découvrir ta culture nostalgique de l’automobile, que je partage en tous points, comme Dan te l’a sûrement dit. On a déjà parlé des 4L lors du Tour de France. Mais j’ai aussi été l’heureux propriétaire d’une Saab 900, l’un des derniers exemplaires les plus aboutis, puisqu’il s’agissait d’une Turbo 16S S-Line de 185 ch, millésime 1992. Elle tenait tellement la route que j’en ai fait halluciner plus d’un sur l’autoroute du sud à cette époque de déchéance automobile désormais révolue. Au chapitre Citroën, j’ai eu une C5 V6 essence avec suspension active, elle aussi imperturbable sur parcours sinueux ! Quel plaisir ! Après six Porsche, dont des flat-six et des 944 S2, une GOLF GTI 5, propulsée par le fabuleux TFSI à injection directe de 200 ch, trois Mercedes CLK, dont l’inavouable CLK 55 AMG poussé à 400 ch, je suis aujourd’hui, par manque de moyens parce que mon fils aîné poursuit ses études à Aix (Sciences Po), propriétaire d’une OPEL CALIBRA turbo 4X4 de 1995, qui n’a vraiment pas froid aux yeux ! 245 ch et 4 roues motrices sans monogramme sur la malle arrière…, tout ce qu’il faut pour s’amuser sur les routes de l’arrière-pays. Quand nous nous verrons la prochaine fois pour la cause professionnelle, je t’exposerai les nombreuses autres aventures automobiles que j’ai connues, comme la R8 Gordini, la R5 GT turbo, ou encore les Range-Rover V8 bidouillés qui ont occupé mon temps ! Bravo pour ton site et ne laisse pas les aspirations politiques de notre temps saborder notre passion. Aha! Now I see what you mean about the Peugeot platform… the farmer’s one here is on the extended A-Series chassis… not the later LNA / Visa chassis. We have a Merc E300 TD [that’s Turgid Diesel… not Turbo] which is currently the cheapest to run… it does the same distance per litre as the 425 Deuche… currently 1.42€ against 1.64€ per litre [of 98] here in Indre-et-Loire. But it was the 2CV that was used in the snow… you can’t beat it. I believe all Visas were based on the 104 platform, same with LNAs. Those old Mercs are bulletproof, I’ve had five of them and the only major problem I encountered was with the 4Matic system on a w124. I ended up disconnecting it altogether and went on my way. No, all the first series of Visas were on a version of the A-Series chassis… this has been used to good effect with some of the stretched 2CVs with Visa engines for pulling power. The ‘garagiste’, in Yorkshire, who put a new chassis on our ’89 2CV had a Acadiane/Visa-powered van using this arrangement… it meant slightly lengthening the front end [10cms let into the bonnet and wings]… he had done it very nicely… you had to look twice… and it only really stood out when parked against another Acadiane. The air-cooled Visas and the HY are honorary 2CVs in the UK! I don’t think so, about the Visa. 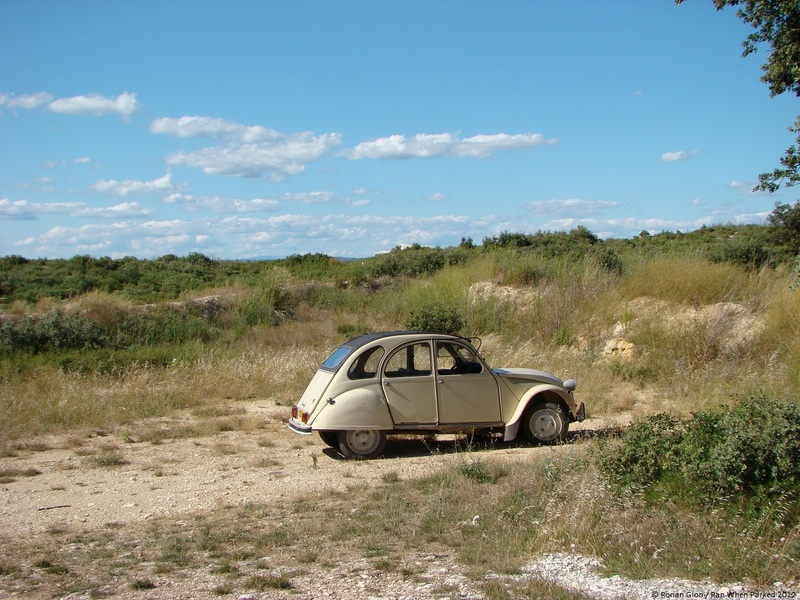 All Visas were unibody, none had the body-on-frame construction of a 2CV. Looks like you’ve got a thing for your Classic French cars. That ’69 R4 looks cracking. Hope it’s back up and running, only 300 left on UK roads. It’s not running yet, I have 2-3 other small projects to finish before I start working on it again. Vous avez une belle collection! Quelle est votre preferee? I loved the Renault 4 1985, the year I was born! The 2CV is “marrant”. I like old cars, however having and driving a VW Bus is the must funky experience you can ever have! ,¡Felicidades desde México! What a great collection of vehicles Ronan, so different from the scrunched-up and compressed look of today’s cars. Your cars truly have some architecture involved, and I can see why you hang onto them. My cars have included a Volvo 144 and 164., Peugeot 505, never got that elusive 604, a Saab 900s,a Bmw 528e, and currently a Volvo 1989 780 Bertone, with the PRV V-6 engine. Thanks for taking care of your website and keeping these shots alive. The R4 ? The hole in the roof was for a blue rotating lamp not a siren. How do I know ?…was chased by one down one of Fance’s auto routes. It had a siren blaring, but not from the roof. Ha, experience speaks volumes. Thanks. The 9th International Biennial of Design Saint-Etienne (France) will take place from 12th March to 12th April 2015. The general theme of this new edition is “The Meanings of beauty”. The Post-Diploma Design and Research team of École Supérieure d’Art et Design de Saint-Étienne, led by Rodolphe Dogniaux and Marc Monjou, is in charge of an exhibition focused on Objects Tuning which will take place at Museum of Art and Industry of Saint-Étienne from March 12th to 15th June 2015. Under its bad side style, tuning reveals a great wealth and states a real act of resistance, the desire to exist by material creation, a commitment, values that put into perspective erratically and straight out our perception of the world today and our relationship to objects. Curators aim at correlating objects coming from different fields as art, design or amateur practices, in order to establish a dialogue giving an unexpected insights but radical and direct yet, about these disciplines and everything related to material culture by extension. They believe that the practice of tuning has a lot of things to say about object, standard, industry, performance, desire, author, amateur, use, ornament, rollover, etc. Please keep us informed of the availability and the modalities of loan of the piece. Any elements you agree to place on loan with us will be insured down to the very last nail, the event organisers incurring all insurance and transport fees, of course. In the attachment, you will find information about the Biennale Internationale Design Saint-Étienne and about the theme of the edition 2015. In the hopes of receiving a favorable reply, we thank you for your consideration and extend our sincerest regards. Thanks for the correction, I appreciate it. Leave the bug as is, it is mean looking…modified bugs are just plain cool! It still looks the same, I haven’t gotten around to making any changes. Who knows, maybe it’ll stay that way.